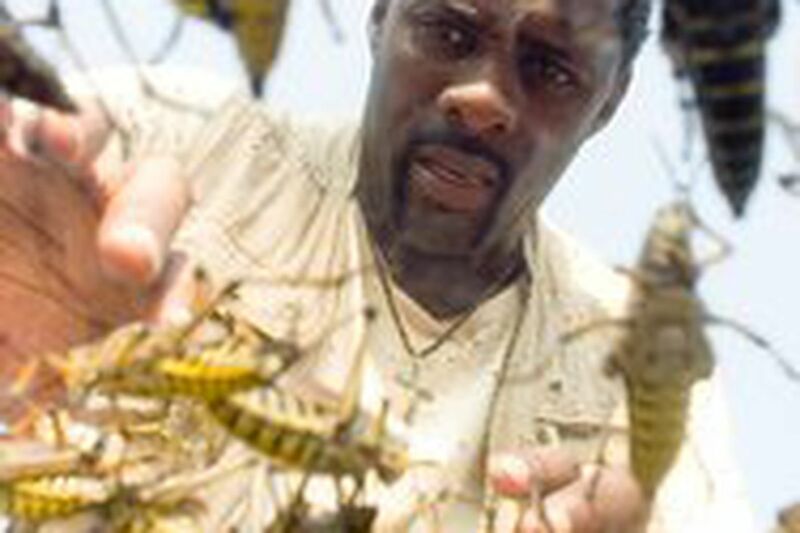 Idris Elba in the apocalyptic thriller "The Reaping": Conservative fable preserving prevailing morality. The river's already turned to blood when Katherine Winter arrives in the sleepy lil' Southern town of Haven. Readers of the Bible will recognize the bloody water as the first of the 10 plagues God inflicted on Egypt in the Book of Exodus. And Haven is headed for the same rough ride in The Reaping, Hollywood's latest exercise in apocalyptic imagination. Film history is full of disaster flicks and calamity tales: Volcano destroys Los Angeles! Global warming covers the East Coast with a glacier! A comet is headed straight to Paris! They express an urge to wipe the slate clean, to raze your Lego town or do a Ctrl-Alt-Delete on the universe to start anew. They also mask a more deeply hidden feeling - a guilty, masochistic desire to be punished for making a world so undesirable that it needs to be razed. Katherine, portrayed by Oscar-winner Hilary Swank, is a minister-turned-scientist who comes to investigate the plagues. She finds townsfolk trembling before the human abomination controlling the supernatural disaster: the sweetest 13-hear-old girl you can imagine, Loren McConnell (AnnaSophia Robb). While Haveners see Loren as spawn of Satan, Katherine, whose own daughter was killed during a mission in Africa, sees (or seeks?) God in her. It's as if Katherine believes that by loving Loren, she can expiate her guilt for losing her own girl - or her faith. Critic and novelist Susan Sontag has argued that disaster films give us permission to see our own antisocial or violent desires reflected on screen. But in the end, these are conservative fables that try to preserve the prevailing morality in the face of change. That's what happens in The Reaping: By movie's end, Katherine abandons her rigid scientism to fall back into the warm, assuring arms of religion. But the film's larger social implications give pause. Like many science vs. religion flicks, The Reaping implies that our choice is either atheism or faith in the most simplistic, anthropomorphic God - a deity who punishes bad acts through plagues and floods. Incredulous that so many see God this way? Consider televangelist Pat Robertson, who said Hurricane Katrina was God's way of destroying New Orleans as a den of iniquity. "Is it any surprise that the Almighty chose to strike at Miss DeGeneres' hometown?" asked Robertson, who was incensed that a lesbian was chosen to host the 2005 Emmy Awards. It's vital to remember what is owed to tradition and to be careful not to endanger our value system. But gothic fantasies such as The Reaping may do far more harm than good when it comes to the responsibility we have to the future.